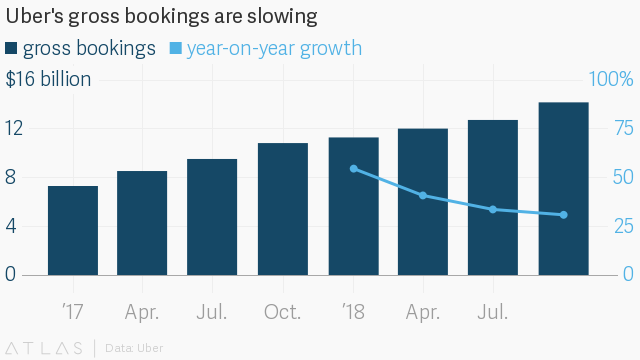 Uber no longer looks unstoppable. The company’s growth has slowed dramatically, according to financial results Uber shared with investors yesterday (Feb. 14) and released more widely today. Uber generated $14.2 billion in bookings in the quarter ended Dec. 31, a figure that includes what customers spend on Uber rides, Uber Eats orders, and other Uber services. The company reported $3 billion in revenue, which is roughly the share of bookings Uber is left with after paying out wages to Uber drivers and delivery people. 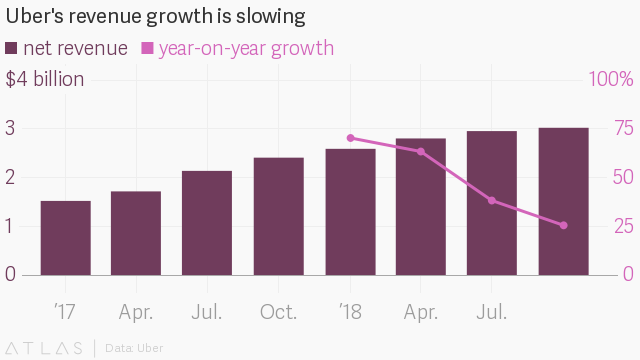 Both those figures, up from the same period a year earlier, represented Uber’s slowest growth rate for 2018. Uber lost $865 million in the latest quarter, down from a loss of $1.07 billion in the third quarter of 2018. The deceleration in Uber’s bookings and revenue could alarm investors as the company prepares for an initial public offering expected this year. Uber doesn’t break out geographic segments or product segments like rides and Eats in its financial reporting, making it hard to pinpoint the source of the slowdown. But in each of the past three quarters, Uber has highlighted Eats, new investments in electric bikes and scooters, and its trucking platform Uber Freight while saying relatively little about the core rides business. You can read between those lines. “In 2018, our ridesharing business maintained category leadership in all regions we serve, Uber Freight gained exciting traction in the US, JUMP e-bikes and e-scooters are on the road in over a dozen cities, and we believe Uber Eats became the largest online food delivery business outside of China, based on gross bookings,” Uber chief financial officer Nelson Chai said in a statement shared with the 2018 fourth-quarter results. Uber hopes to be valued at as much as $120 billion in its IPO. The company was last valued in private funding at $76 billion. Both Uber and Lyft filed confidential draft paperwork for an IPO in early December and received initial feedback from the US Securities and Exchange Commission earlier this month, Bloomberg reported (paywall). Its biggest domestic ride-sharing rival, Lyft, is said to be targeting an offering as soon as March, Bloomberg reported. One reason Eats may be particularly attractive to Uber right now is that food delivery generally faces fewer restrictions than ride-hailing, which is mired in the same rules that govern taxis in many states and countries. Eats has helped Uber establish a presence in places where rides are trickier to operate or get approval for from local authorities, such as in Japan. Forbes reported earlier this month that Eats is on track to deliver roughly $10 billion of food globally in 2019, which could translate to an additional $1 billion in revenue for Uber. On a call with investors yesterday, chief executive Dara Khosrowshahi said the global Eats business could soon surpass Lyft in terms of total bookings, a source familiar with the call said. Uber is the third-biggest player in US online food delivery in terms of market share, after being overtaken by delivery startup DoorDash in November 2018, according to anonymized credit card transaction data from analytics company Second Measure.